Transmissions built for diesel engines are altered to provide additional holding capacity at lower pressures. The term “diesel transmission” is kind of a misnomer. The engine is what operates on diesel fuel. 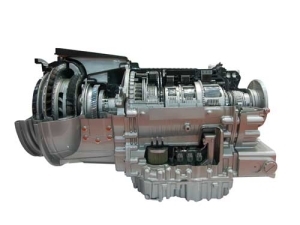 The transmission is simply built stronger to handle the additional power that diesel engines create at lower engine RPM. That’s not to suggest that the diesel engine isn’t of critical importance to consider when building the transmission. It is. And it requires a lot of small — but extremely important — alterations to handle that difference. The problem goes like this: The transmission depends on the engine RPM to turn the pump and build oil pressure. The faster the engine RPM, the more pressure the pump will build, so the more power the transmission can be made to handle. But diesel engines develop their power at a lower RPM than gas engines. So transmissions built for diesel engines have to be altered to provide additional holding capacity at lower pressures. It means more efficient pumps, more clutch surface, and larger apply pistons. And of course, those diesel engines are usually in hard working trucks or busses, which places an even greater demand on the transmission. The technicians at your nearby Cottman center are well versed in the demands on the transmissions that sit behind diesel engines. They know how hard those transmissions work, and they know how to build in that additional capacity to make sure the transmissions they build can handle the extra load. What’s more, they have a range of upgrades available, to make a transmission that was strong from the factory even stronger and more dependable. How can you be sure to get all the additional capacity you need in your diesel transmission? Talk to the folks at your local Cottman center. Explain what you’re using your truck for and discuss your needs with them. They’ll help you choose the right level of power handling capability for your specific requirements. But whether you simply need a factory level rebuild or want a transmission strong enough to pull a house down the road, you can count on your local Cottman technicians to work with you to build the transmission that’s just what you’re looking for.